Create a memory by booking a River Boat Cruise aboard the Macassa Bay. We offer a whole host of cruises for 2013. 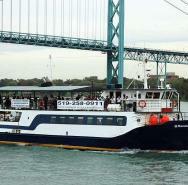 Consider sightseeing, lunch cruises, dinner dance cruises, Amherstburg, and many more. The Macassa Bay can also be used for private charters for almost any type of function. Cruises run from April to October.